Russian engine company Aviadvigatel is developing a turboshaft that can power the Mil Mi-26T, based on the PD-14 turbofan that is now being flown an Il-76 testbed. Current versions of the heavy-lift helicopter use twin D136 engines that were developed by Ivchenko Progress and are in production at Motor-Sich, both companies based in Zaporozhie, Ukraine. Russian Helicopters deputy general manager Andrei Shibitov told AIN that Russian government customers would prefer the re-engined version. A prototype is expected to fly in 2017, with production examples to follow in 2018 and 2019. At the recent HeliRussia exhibition in Moscow, deputy trade and industry minister Andrei Boginsky said that work on the new engine is proceeding quickly, with his ministry providing extra funding. The engine is designated PD-12V and can develop 14,500 shp. However, it will be flat-rated to 11,500 shp to match the Mi-26’s existing gearbox. This power can be maintained to the altitude of 2,000 meters or at ambient temperature of +40 degree Celsius at sea level, thus improving the helicopter’s hot-and-high performance. According to Aviadvigatel, the PD-12 is 100 kg heavier than the D-136, but burns 18 percent less fuel. The developer says that a full-scale mockup has already been made so that designers can do a test-fit on Mi-26 airframe. The PD-12 is also offered on the Sino-Russian Advanced Heavy Lift (AHL) rotorcraft now in development. 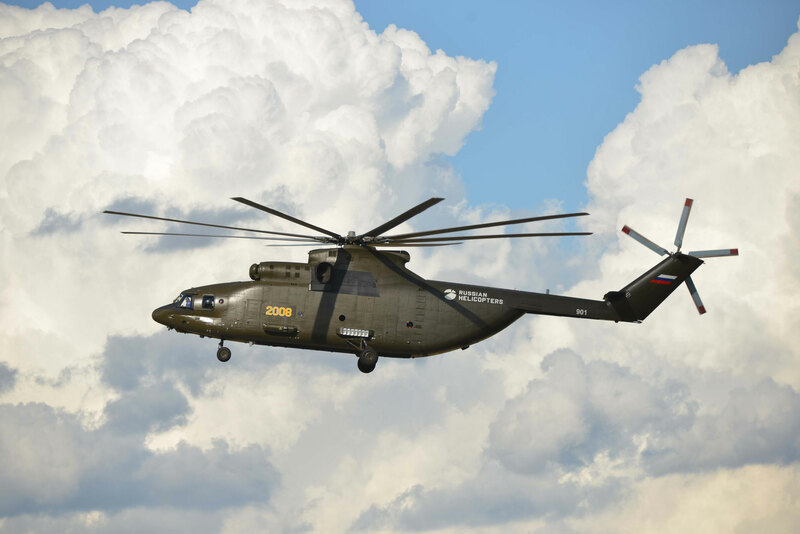 Preliminary studies done by United Engine Corporation (of which Aviadvigatel is a member) revealed that the refurbishment would improve the Mi-26’s payload-range and reduce operational costs through higher technical parameters and “on-condition” maintenance. The baseline PD-12V will provide a basis for the development of a family of engines.